Owing to twin distractions of my new sewing machine and an unusual influx of books by Diana Wynne Jones, I'm really only actively working on two knitting projects right now. Since they're both socks I've been doing a bit of an experiment. Question: where do I knit most - watching TV, or not? The Zombie socks are wedged so nicely into a bucket in my coffee table cubby, I hate to move them to any other location, even temporarily. If I sit down to watch TV or a movie or just have some quiet time under good lighting, I pick up the Zombies. But the Monet socks are portable, and the only non-mindless thing about them is that they're on superdupersharp needles. I have to be extra careful not to knit too close to other people because I'm so nervous about hurting someone. 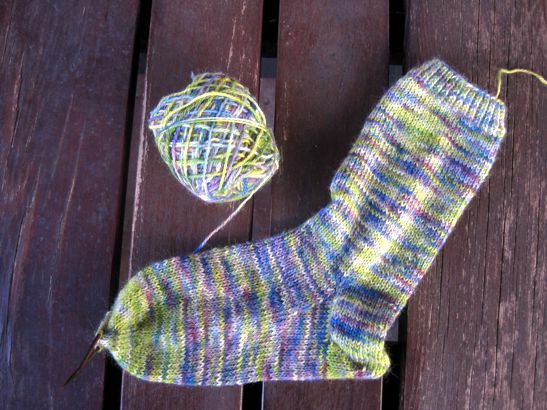 Early in the week, the two socks in progress were about equally as far along. The Zombies have a pattern stitch - and now that I think of it, more stitches overall - so naturally each round takes a bit longer than the Monets, but my being a homebody should sort of balance things out, right? The Monets don't have it all wrapped up yet though. The Valentines' sewing is as done as it's probably going to get, I'm on the last book and trying to eke it out, and I'm still sick, which means if I'm not asleep I should be resting on the sofa instead of vacuuming or cleaning the bathroom or some other crazy thing I hear people do on a semi-regular basis. Also: at some point over the weekend I dropped a stitch on the Monets, and put it back on the wrong needle, and didn't do a stitch count before I started the toe. On the right side, the decreases are now skewed toward the sole, and I might yet decide that bothers me enough to rip back and redo them. I love how the green looks like you did it on purpose! Of course, I love green so that's a biased opinion. Hope the chocolate helped prevent frogging!